4 shows into the tour now... Currently writing this from a little coffee house in Holland, MI. The people here are unbelievably kind. Just had a stranger who I now know is named Ron walk up to us and give us a Shell gas card because he believes in what we're doing and had heard that Gracie and I had taken some "risks" in order to make this tour happen. He wasn't even at out show last night! I love it. We ate breakfast at a place called Deboer's where I may have had the best omelette of all time and then took a stroll to a local historical landmark called "Big Red" which is an old light-house that has been settled on the coast for over 100 years now. The wind off Lake Michigan was crisp and its blue water was crashing on the rocks while some fisherman passed by through the channel. Needless to say, it's been a good morning. I even lost AND found my wallet already. Our show in Fort Wayne on Friday was great too... We ended up leaving the camper parked in the driveway and set up the show outside of this great little barn that the hosts had on their property. 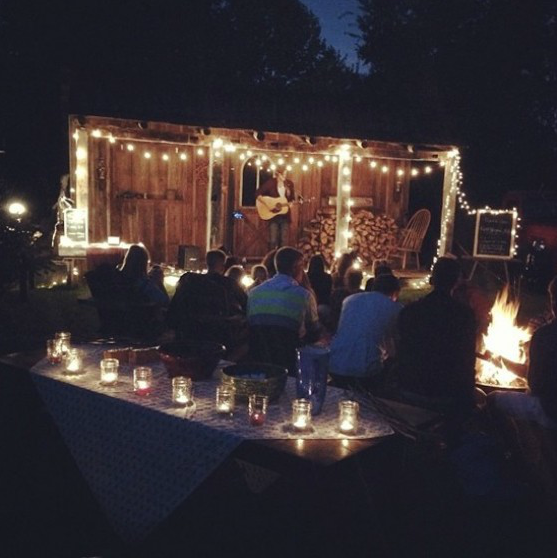 It was a dreamy little set up with a campfire and blankets out front of the stage. Looked like Southern Living magazine or something... or Midwestern Living. Is that a thing?Anyways, people are good and God is great. I'm really thankful to be doing this and excited for the rest of our shows this week.